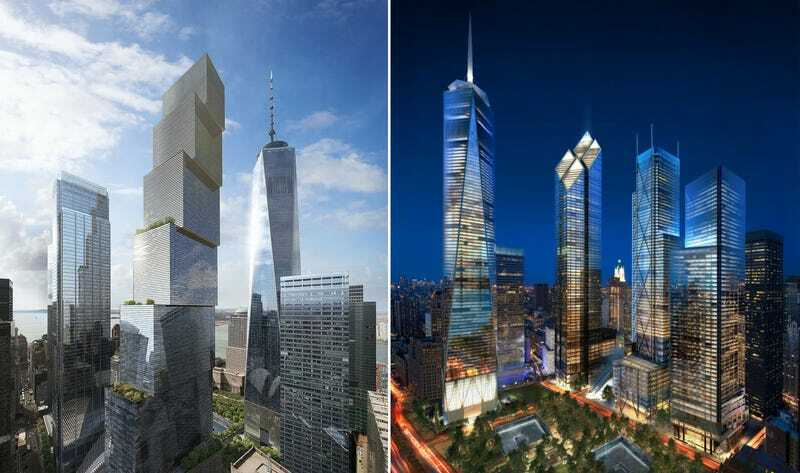 We finally have our first look at the World Trade Center’s skyscraper, thanks to a Wired exclusive today. But wasn’t this building already unveiled years ago? And wasn’t it designed by someone else? Wasn’t it under construction? In fact, work on the tower got underway, with construction on the foundations in progress when it stalled due to a lack of demand from potential tenants for the 88-story tower. Enter Rupert Murdoch, who is now the savior of the project. Back in April, The New York Times reported that Murdoch was negotiating to kickstart the project by moving 21st Century Fox and News Corp to the complex—and that he might change the architect. Today, Wired confirmed that Foster has been kicked to the curb. Instead, the young Danish architect Bjarke Ingels will design the skyscraper—his renderings show a tower with two sleek glass sides and a stepped series of outdoor terraces on one side. What was wrong with Foster’s design? According to Wired’s Andrew Rice, Rupert Murdoch’s son James thought that the design just didn’t fit the vibe of a “modern media company” like News Corp. “That’s why Foster ended up being bumped aside in favor of Ingels, who is exactly half his age—a wunderkind by the standards of the profession,” says Rice. Of course, this is far from the first time a skyscraper’s design has been changed while it was still under construction. Architecture, especially in tall buildings, changes alongside the economic and political forces that shape it, even when it’s already underway. Sorry, Lord Foster—a modern media age beckons. For more on the new design, check out Wired’s story here.